Derry City stormed their way into the semi-finals of the FAI Ford Cup after putting on an astonishing display over Mervue United at the Brandywell on Friday night. The 30 year-old Derry forward surpassed Liam Coyle’s record of 112 when he netted his 113th goal in the second half. Farren’s feat was made all the more memorable by the fact that his record breaking goal was also his third of the game and referee Tomas Connolly handed the player the match ball after the game. Farren will join Irish League side Glenavon at the end of the season and it’s understandable that he’ll feel a sense of relief at having beaten Coyle’s long standing record. Derry players McDaid (2), McEleney and Curran all weighed in with the remaining four and Mervue player, Pat Hoban, snatched a consolation goal for the visitors in the second half. Mervue did not register one shot on or even off target in the first half. In fact, John Glynn’s team were so poor that you would have suspected that the six and seven year-olds who provided the half time entertainment might have given them a game. Derry were on top from the start. The Candy Stripes enjoyed so much possession that you would have been forgiven for thinking that the 11 players on the pitch for Mervue had never played the game of football before. Declan Devine’s men took the lead in the 13th minute when the impressive Barry McNamee found team mate David McDaid inside the Mervue box with a corner. McNamee’s corner was well taken and all it required was the slightest of touches from the head of McDaid and the ball was in the back of the net. Clearly Flynn’s game plan, if he even had one, had back fired and he attempted to increase his team’s threat up front by pushing Tom King up into the attacking line with Jason Molloy. Mervue’s change in tactics from a 4-5-1 to a 4-4-2 was to be their undoing as Derry would go on to score another two goals before half time. Stephen McLaughlin went close to doubling his team’s lead in the 18th minute but his left foot drive from inside the area crashed off the post. Barry McNamee found team mate McDaid with a decent pass through the middle in the 22nd minute; McDaid shot was powerful but sadly the ball flashed wide of Conor Gleeson’s goal. McLaughlin was within inches of scoring a remarkable goal in the 25th minute. Shane McEleney passed the ball to brother Patrick who in turn unleashed Simon Madden down the right hand side; Madden, as ever, sprinted clear and floated a cross into the area; McLaughlin reacted immediately with a right foot volley from close range but somehow he put his effort over the bar. Derry inevitably scored their second soon after in the 34th minute when Simon Madden found Mark Farren inside the area. Farren took full advantage of Steven Walsh’s failure to clear, took one touch of the ball and smashed it past Gleeson. It was Farren’s 111th goal for Derry and edged closer to breaking the longstanding tally of 112 set by Derry City legend Liam Coyle. Patrick McEleney tried to test Gleeson with a long range effort in the 37th minute but despite the winger’s best efforts, his shot went wide. If anyone thought that McEleney’s previous effort was ambitious then what followed was just plain absurd. Central defender Ryan McBride passed the ball to McEleney inside his own half; the 19 year-old winger crossed the half way line, looked up to see Gleeson off his line and let loose with a perfectly weighted lob over the ‘keeper’s head. Derry could have increased their lead to four goals in the 49th minute when Gleeson failed to deal with a McNamee shot from inside the box. McNamee’s shot lacked power but still Gleeson couldn’t get a hold of the ball; David McDaid attempted to score from four yards out but Gleeson blocked his effort and eventually got the ball under control. Mervue midfielder stunned everyone inside the Brandywell when he found the back of the net with a 30 yard drive in the 52nd minute. Hoban had space and time to get his shot away and the ball flew past Doherty into the bottom right corner. Mervue’s threat of a comeback lasted all of four minutes as David McDaid scored his second of the game and 13th of the season in the 56th minute. After picking the ball up from team mate McNamee, McDaid took one touch inside the box before smashing the ball low and to the right of Gleeson – a top drawer finish. Mark Farren equalled and proceeded to beat Liam Coyle’s goal scoring tally within the space of a minute when he netted Derry’s fifth and sixth in the 60th and 61st minutes respectively. Farren’s second strike of the night came courtesy of a bizarre back pass by defender Elwood; the defender’s pass was a gift to Farren who stood completely unmarked but kept his composure to slot the ball into the net. The Greencastle man’s 113th record breaking goal came seconds later when team mate and fellow Donegal man, McNamee, threaded a pass through the Mervue defence; the speed with which Farren raced clear of the defenders was reminiscent of a Mark Farren from five years ago. If Farren’s speed was impressive then his finish was outstanding; he looked up once after bursting into the box on the left before smashing the ball into the bottom right corner. The Derry City scoreboard immediately recognised Farren’s feat as it displayed in bolt red font ‘One Mark Farren – 113’. Smartphones snapped in tandom as hundreds of fans sought to share the screen’s offering on Twitter and Facebook. 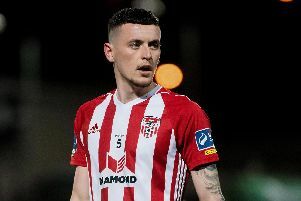 Derry youngster Ryan Curran added a seventh in the 77th minute when he connected with a David McDaid cross to the back post. Curran was completely unmarked inside the area and guided the ball over the line from one or two yards out. It was the St. Columb’s College pupil’s first goal for his hometown club and perhaps one of the easiest he’ll ever score. Barry Molloy could have made it 8-1 in injury time but his shot from eight yards was hit straight at the feet of Gleeson. Derry City: Gerard Doherty; Dermot McCaffrey, Simon Madden, Ryan McBride, Shane McEleney; Barry Molloy, Barry McNamee, Stephen McLaughlin (Ryan Curran 64 mins), Patrick McEleney (Marc Brolly 64 mins); Mark Farren (Kevin Deery 77 mins), David McDaid. Subs not used: Eugene Ferry, Caoimhin Bonner, Michael Duffy. Mervue United: Conor Gleeson, Michael McSweeney, Shane Keogh, Michael Elwood (Martin Conneely 64 mins), Steven Walsh; Tom King, Noel Varley, Cain McBrien, Pat Hoban, Jean Biansumba; Jason Molloy. Subs not used: Andy Higgins, Brian Connolly, Damien O’Rourke, Ethana Nkololo, Daniel Cunningham, Ger Hanley. REFEREE: Mr. Tomas Connolly (Dublin).